Here is Gina Clifford from Spotty Banana blog with a new guest post. Gina is the author of the eclectic home learning blog Spotty Banana, where she shares information on all sorts of subjects. Gina is a child-led, project-based learning advocate who enjoys exploring fun math, science, and technology-themed activities with her son, who is a fanatic like her. 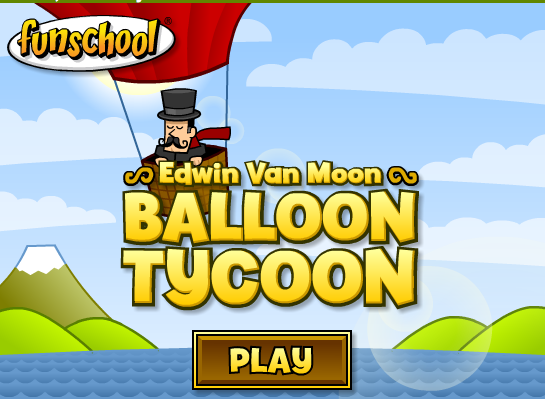 Learning geography is a hoot with this free online funschool game featuring Edwin Van Moon, Balloon Tycoon. In the game, Edwin loves to travel the globe in his hot air balloon. He knows where he wants to go but he does not know how to get there. Kids will love directing Edwin around the world by moving the mouse. Edwin provides clues to help young learners and rewards success with stamps on a virtual passport. Players win when they have filled their passport with stamps. Because the game assumes some knowledge of geography, young learners might consider using a globe or atlas as a guide. When our son first started learning geography, he pulled our globe over to the computer and used it as a reference. Eventually, he learned to direct Edwin successfully without the globe. Having the globe as a reference was a real asset, though, as he really enjoyed the enhanced interactive learning experience. We really like the design of the game. Although challenging for the beginner, the animation is cute and friendly, making this an excellent game for seven and eight-year olds. 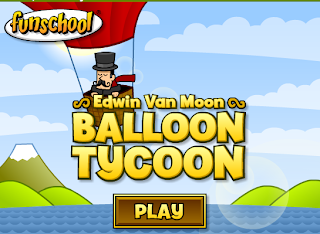 The Edwin Van Moon, Balloon Tycoon game is hosted on the funschool.com website, which does display ads. However, none of the ads we saw were inappropriate even for young children.